The fitting client enables users to generate false-colour maps of their selected model parameters, to adjust the range over which the colour map is applied for each parameter, and to produce a ‘merged’ image where the intensity of the false-colour, at each pixel, is modulated by the relative brightness of the original data. This allows particular features to be visually highlighted and structural, as well as lifetime, information to be represented in a single image. The software also provides for the convenient display of histograms of each fitted parameter, as well as correlation and error bar plots. All these images can be saved into OMERO, enabling sharing and collaboration. 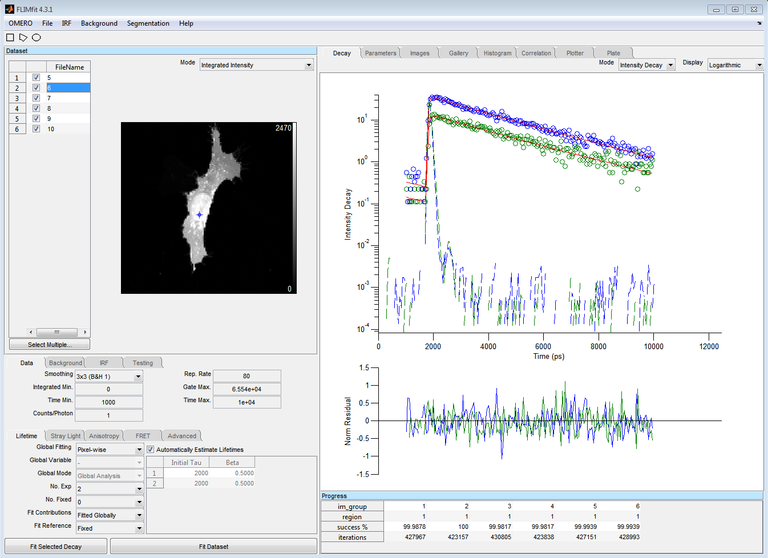 This software was primarily developed by Sean Warren within the Photonics Group of the Physics Department at Imperial College London as part of his PhD project, which was supported by the UK Engineering and Physical Sciences Council through a studentship from the Institute of Chemical Biology. This was undertaken with colleagues from the Photonics Group (Yuriy Alexandrov, Dominic Alibhai, Christopher Dunsby, Paul French, Douglas Kelly, Sunil Kumar, Romain Laine, Ian Munro, Clifford Talbot) and its integration with OMERO was supported through a Wellcome Trust grant entitled “The Open Microscopy Environment: Image Informatics for Biological Sciences” (Ref: 095931) in collaboration with colleagues from the University of Dundee. Please explicitly acknowledge “the FLIMfit software tool developed at Imperial College London” in any publications benefitting from its use. In order for us to monitor the use of FLIMfit and to support its ongoing development, we would be grateful if you could send details of any such publications (particularly DOIs of published papers) to: flimfit-users@lists.openmicroscopy.org.uk. For details of this, user support, mailing list please see below. FLIMfit is available under a GNU public “copyleft” license. For questions about the GNU license refer to the Frequently Asked Questions about the GNU licenses page. The text can be found here.